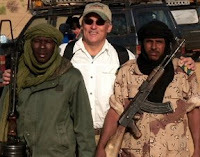 On the left, MW ( D), providing aid and comfort to the enemy. On the right, MW (R) , soliciting illegal corporate contributions to lobby corrupt members of congress for political favors. For a year the idea had haunted me, and Thursday night it returned more insistently than ever. 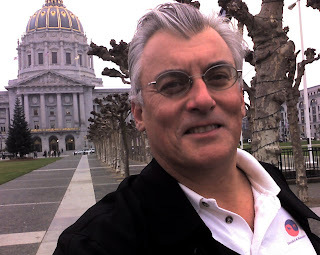 If a Democrat became a Republican in San Francisco, what adjustments would he have to make? What is it like to experience discrimination based on political belief, something over which one has limited control? This speculation was sparked again by the blog post glowing on the laptop screen in the den of the high rise condominium that served as my office. 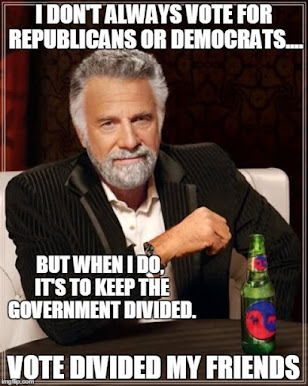 It was Jon Swift's "Best Blog Posts of 2007" year end round-up, linking my June 23rd screed explaining why I must become Republican in order to preserve divided government. In an overlapping window on the screen, a story from the LA Times  showing how new California Republican primary rules might work to Ron Paul's advantage in heavy Democratic districts like San Francisco. As few as 7,000 Ron Paul votes in San Francisco (California Congressional District 8) could garner as many delegates at the Republican convention for Ron Paul as the Republican winner in "Loyal Bushie" territory like Orange County. Another window was open to the December 5th Evans-Novak Report - Money quote: "Republican confidence about winning the presidency actually has declined... We have had several Republicans tell us ... they wondered not only about the outcome of the '08 presidential election but also the long-range future of the GOP." If it was that bad for Republicans in the rest of the country, what would it be like for Republicans in San Francisco? I feared for the local Republicans, despite the assurances of the supposedly "tolerant" Democratic San Francisco Mayor and all Democratic Board of Supervisors, who continue to insist they represent a culturally diverse community, committed to tolerance and the the rights of all, claiming to accept and embrace people of all colors, creeds, religions, sexual orientations, and beliefs. "Right." I thought. 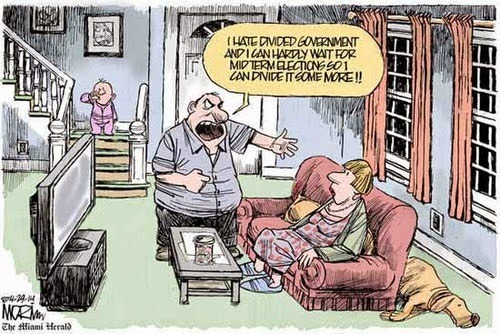 "They tolerate everyone except Republicans". I lingered on, looking out at the view of Alcatraz and San Francisco Bay. My wife slept in the room next door. I sat there, surrounded by the cool ocean breeze coming through my open window, listening to the sea lions barking in Fisherman's Wharf, unable to leave, unable to sleep. How else except by becoming a Republican could a Democrat hope to learn the truth? Though we lived side by side throughout the blogosphere, communication between the two political parties had simply ceased to exist. Neither really knew what went on with those of the other party. The Republicans will not tell the Democrats the truth. In 2006 they learned that if unpleasant truth is revealed to Democrats, the Democrats will cause Republicans to lose elections and go to jail. The only way I could see to bridge the gap between us was to become a Republican. I decided I would do this. I prepared to walk into a life that appeared suddenly mysterious and frightening. With my decision to become a Republican, I realized that I, a political blogger, knew nothing of the Republican's real problem. I knew then that I must enter 2008 as a Republican. Friday was gray, cold, wet and depressing, matching my mood perfectly. Except for the wet part. 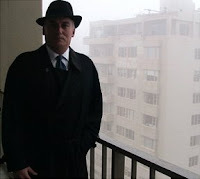 I donned my best "Jack Abramoff" trenchcoat, and walked down the hill to City Hall. 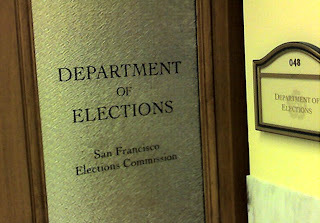 The San Francisco Department of Elections is in the basement of City Hall. It was a short easy form. In a few minutes the painless procedure was over. I was a Republican. I asked the clerk if I was the only Republican in San Francisco. "No." she said as she turned her back and walked away. "There are some others." She didn't seem interested in talking to me, would not meet my eyes, and behaved as if I was not even there. "I am still me..." I thought. "I have not changed." Yet, somehow it seemed things had changed around me. 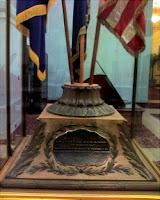 As I walked out, I stopped to look at a memorial in City Hall for soldiers of the Army's 363rd Infantry Regiment, the unit called "San Francisco's Own." The memorial commemorates the combat action of the unit in the 1918 Battle of the Meuse-Argonne. 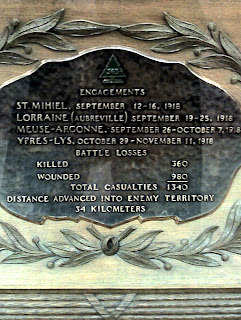 The plaque says "360 killed, 980 wounded..,Distance advanced into enemy territory 34 kilometers." On the way in, as a Democrat, I wondered if those 34 kilometers were really worth the 1,340 casualties. On the way out, as a Republican, I was ashamed of myself for not supporting the troops and questioning the wisdom of our WWI leadership. In the rotunda a wedding was in progress. A heterosexual wedding. In front of a Christmas tree. My first thought - "Bill O'Reilly needs to know about this." Maybe there is some hope for The City. 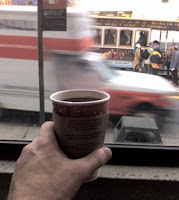 Walking back I stopped at a Starbucks on the corner of California and Van Ness to warm up. Earlier in the day, as a Democrat, I had ordered a Vente Double Latte with organic Guatemalan espresso regalo, certified grown without exploitive labor practices, half caf, half decaf, no-fat milk. Now, as a Republican, all I wanted was a small coffee - black. 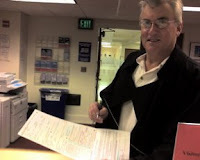 When I got home, I thought back to what the election clerk told me, but found no comfort knowing I was not the only Republican in San Francisco. I refused to wallow in self-pity. After all, being a Republican in San Francisco could not be any worse than a Libertarian lesbian lawyer becoming a Republican in Arizona. I had it easy. But I would need help facing this brave new world. I sat down, poured myself a scotch, and flipped on Fox News. Technorati tags: Democratic, Republican, Ron Paul, libertarian, San Francisco Values, 2008 Election. This is the first post I've read on your site. I love your theme- it coordinates beautifully with a lot of what I write about at Publius Endures. I would be interested in a blogroll exchange. Thanks Mark. Checked out your site, and you are blogrolled. I'm sure I'll spend some more time there. Definitely a "fellow traveler". MW, it's refreshing to read the non-party writings from an actual principled bend. I completely agree with your rankings of the politicians on your left sidebar. Ron Paul is ideologically the only sound call in the candidates. Thanks, shaun. Heading over now to link up.